Stop the streaks and find some ease in the chore, we’ve zoned in the six best mops for laminate floors. For the temperamental floor surface that doesn’t generally like soap, or water for that matter, we’ve weighed the options and compiled a list of the best picks out there on the laminate mop market. From simple stick handles and mop pads to dual action suction and scrubbing devices, we’ve spanned the broad spectrum of features and functions that you can use during the pursuit of polished, shimmery, dust-free floors. Whether manual motion, powered scrubbing or automatic robo-mop action is what you seek, there’s a mop out there just waiting to make your laminate floors shine again. We’ll dabble in microfibers, mop pads, adjustable handles and virtually hands-free, phone app operations. You can remove dust, dirt and dander in one scratchless swipe. You can wash many of the mop pads so they are ready to clean another day. For chemical-conscious consumers, there have never been more options and methods that cater to keeping solutions clean and green. Nothing adds character and class to a room like a shiny, spotless wood floor does. The sparkling bright finish, free of pet hair, dust and tiny particles of dirt, anchors a room’s decor and sets a tone of tranquility and simplicity. It’s a flooring scenario that most of us have always dreamed of in our own private Pinterest-picture filled minds. Back in the real world, tiny cars are flying across the apparently racetrack-grade, once-new but now not-looking-so-new laminate floor. Crumbs, sticky drips and water spots elude the quick clean up attempts. Dogs shake and scratch, cats leave delicate deposits of dander, and for the millionth time, would people please take off their shoes? Laminate can be a finicky floor finish to maintain, and while installation can be easy, and the price can even be right, the cleanup process of this gorgeous, simulated hardwood floor can be filled with streak marks, sticky residue, rogue tumbleweeds of pet hair and (gasp), the dreaded puddle of water. What type of cleaning solution or method do you want to use? How much weight do you want to move around? Less is more when it comes to getting laminate floors back to their original sparkly selves. Regular floor cleaning solutions and oil soaps are a big no-no when scouring a laminate surface. Sticky residues, streaks and sometimes even damage will result from the use of these normal household solutions. The ability to be flexible with cleaning solution options could be pretty important. Some mop manufacturers also make specially-formulated cleaning solutions designed for laminate and these cleaners seem to do a satisfactory job. Users can also make their own cleaners on an as-needed basis, which can drastically save dollars and minimize chemical usage in the house. One of the best options when seeking a squeaky, not streaky clean laminate floor seems to be just plain old life-sustaining water. Sometimes you can mix in a small amount of vinegar for a deeper cleanse. However, the water (which should be distilled) is where it’s at. Steam is, of course, a variation of water and. In most circumstances, you can use it to sanitize and restore laminate floors to a shiny, germ-free state. There are some specific guidelines to follow when utilizing a steamer to clean laminate floors. Some laminate manufacturers recommend against using the method on their floors. The mobility of a mop for laminate floors is probably an important factor to most mop users. Being able to whip a slim and sleek stick and mop head around the room almost makes the polishing process fun. Almost. Most mops are, by nature, pretty lightweight. Some do bulk up a bit when the manufacturer adds features. Those include cleaner dispensers, steamers and vacuuming functions. The pro vs. con list comes into play when determining the trade-off of the extra poundage against the feature’s added value. If you are concerned about its weight, a robot mop might just be the answer. Many are capable of tackling laminate floor cleaning projects with minimal interaction from the user. These automatic moppers tend to take a lot longer to complete a mop job compared to a highly-evolved house-cleaning human, but if TV episodes can be binge watched or sleeping can be done while the bot gets moppy, does it really matter how long it takes? Mop pad material is one of the most important variables when it comes to successfully maintaining a laminate floor. Due to the delicate nature of the flooring surface, a soft, non-abrasive material is essential to keeping the floors shiny and scratch free. The ability to wash and reuse a mop pad is also a consideration when combing mop options. While there is a time and, probably a very gross, place for disposable mop pads, it is obviously more cost effective in the long run to utilize mop pads that you can wash and reuse. Most washable mop pads have some variation of microfiber material. These little fibers are cottony soft and are able to capture dirt and dust while on their floor-finessing adventures. Some mops come with multiple pad styles designed for different cleaning jobs ranging from dry sweeps to scrubbing and buffing. Disposable pads are soft, too, and have their own varied grooves ready to pick up dirt and debris during the moping process. 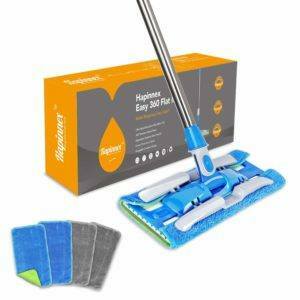 This type of mop pad can be convenient for nasty, sloppy, maybe even germy messes, and it probably isn’t a bad idea to have a small supply on hand, if available, even if the go-to pad is a washable one. There are various methods of operation and cleaning mediums on the laminate floor mop market. We’ve navigated through the sometime winding path of options and concepts and brought the products offering what seems to be the best combination of features and value to the ranks on our list. The usual suspects rise to the top when ranking the best mops for laminate floors. The weight and general mobility of a mop tends to make or break a products value and a user’s experience. Price, features, functions (or lack thereof), and consumer reviews have all factored into the way we’ve ranked these handy helpers. The lightest weight mop doesn’t always win, but usually it does. Floor mopping is labor intensive by nature and a heavy mop just doesn’t make sense. It’s also key to be able to mobilize the mop to where it’s needed most without much effort. Adjustable handles go a long way in helping a mop achieve custom functionality. No two mop operators are the same, so the ability to adjust the handle for optimum mopping action is pretty valuable. While we’re talking about handles, swivel action is also important. This flexible function helps mop pads reach under low-profile furniture, behind bathroom toilets, and along kitchen cabinets. Nobody really wants to touch a dirty mop pad. Some innovative designers have incorporated lever-action releases that allow mop users to drop the mop pad into the garbage or laundry basket without having to re-visit the yuck that you just plucked from the floor. There are various ways to approach streak-free dirt removal on a laminate floor. Once again, these floors don’t do well with most soaps or oil-based cleaners. In the basic mop category, sturdy handles, broad mop heads and microfiber pads are the makings of a nice, handy laminate floor cleaning assistant. You will still need to apply cleaner or water to the floor’s surface throughout the course of a mop fest. Generally, a standard spray bottle will do the trick. Some slightly upgraded manual mops come with on-board cleaner dispensers. The spray bottle is basically attached to them. Most of these mops have levers on the mop handles that control the spray, allowing the mopper to control when and how much cleaner is released. Now, one of the key rules to follow when pursuing pristine and spotless laminate floors is the pre-sweep. This can make a world of difference in the results of a power mop session. Some mops come with dry-dusting mop pads to handle this job, which is all good and fine. Some mops, however, do it…ready for it….at the same time. A few pretty fancy mops have incorporated a dual-function system that vacuums while mopping. This design is especially helpful when it comes to deep cleaning laminate floors, as the mop handles the sweeping while sucking water from the freshly cleaned, water-sensitive floor surface. Then, there’s the steam cleaning option. Steam is mean to dirt and germs and takes the hard work out of most of the jobs in which its involved. This hot vapor has a unique power to dissolve most forms of dirt easily, while sanitizing everything in its path. When all else falls short, call the robot. Is that a thing now? Do we do this? Yes, yes we do. The robot mops really know how to target floor dirt in a grid-like pattern and scrub it away while we do other, much more important things. The robot mops can’t fill themselves…yet, so there’s still some human interaction involved in the process. Most traditional mops obviously run on brute human strength, and really, there’s nothing wrong with that. We’ll call it off-the-grid cleaning, if you will. The ability to grab a mop and scrub a floor is easy and these manual mops are pretty friendly on the debit card, too. When the technology levels rise in a product that requires electricity to do its job, so does the price. And the weight takes a bit of leap, too. While a powered mop can definitely get some serious dirty work done, it comes at the cost of a cord plugged into a wall and a few extra pounds to push around. While there are a ton of neat features out on the laminate mop market, generally, simple and smart functionality wins. Finding the delicate balance of product cost vs. features is always a difficult task, but a low price tag tends to tip the scale in a mop’s favor. There are definitely applications and situations that warrant the use of an upgraded, bells-and-whistles mop. You can’t ignore those sleek systems. Want a steamy sidekick, a vacuum-mop hybrid or a little moppy bot to get in your business? There are some pretty nice options. However, it’s gonna cost you. Extra mop pads and cleaner solutions add a bit of value to a mop’s package. Products that come with dry sweeper pads, or even just extra cleaning pads, are a few steps ahead of those that don’t. The ability to mix cleaner solution as needed is a pretty big money-saving deal. Mops with refillable, on-board cleaner dispensers really add value. Certain mop brands and styles use brand-specific cleaners only. They have non-refillable dispensers. This really drags down the long-term investment value (I know, it’s just a mop) and can end up costing a lot of money over time. What features come with more expensive models? What is the expected lifespan of a mop for laminate floors? What kind of maintenance or usage guidelines do I need to know about? What is the best type of cleaning solution to use? How easily can you acquire replacement pads and other parts? With added price comes added convenience. Some models come with powered, microfiber mop pads or brushes that can vacuum, clean, and polish with each push of the mop. Steam technology is another function you find in products of higher price points. While not all laminate flooring manufacturers necessarily support steam-based cleaning on their products, if you find the right mop with adjustable steam settings, you should be vaporizing floor scum in no time. Other upgrades include on-board trigger-powered cleaner dispensers. They may include additional mop pads. Those tackle various floor sweeping and mopping tasks. Lifespans range wildly from product to product. Most simple, manual stick mops can last 10 years or more, provided that you store them in a safe place and don’t encounter too much abuse. Mop pads are the weak link here, as they tend to last about a year before you need to replace them. You can expect mops with moving parts and motors to kick the non-existent bucket (bwahahaha, no buckets for these mobile mops) sooner than those without. Unfortunately, the fancier the features, the more likely there will be a malfunction or part failure at some point. A quality product will come with a decent warranty of one or two years and be there to hopefully help with any issues that may arise. Most of the upgraded mops do require maintenance like cleaning brushes and mops heads. You should use water in them. It should always be distilled to prevent mineral build-ups in the valves and mechanisms. Lack of maintenance and use of tap water are the two enemies of a mop’s longevity. As noted previously, distilled water should be used any time water is being dispensed from a mop. Mineral build-up can destroy water lines and mechanisms in no time, rendering the water dispensing functions useless. Washable microfiber pads are key to a successful, streak-free mop job. Keeping the mop pads clean and dry are important, too. Most reusable pads are good for 30-40 uses, sometimes more. You can easily wash and air dry them. If a cleaning job isn’t too dirty, a simple rinse under a pressured kitchen sprayer should do the job. The powered mops require a little more attention. Though, in their defense, they’re doing some pretty advanced level cleaning. Rinse scrub brushes after each use, and wipe down the base of the mop. Empty the water tank prior to the mop heading to it’s storage spot. The best type of cleaning solution is simply water. Ideally, hot water (not boiling) in a fine mist spray bottle or on-board dispenser should do the trick in most applications. Some mop users report positive results from adding a small amount of vinegar to their dispenser. This method seems to work just fine, though you should not use the sour sanitizer in robot mops. The vinegar can eat away at their little wheels and render them immobile. Steam can be a good option, too. Free of cleaners and chemicals, steamy water can work wonders on dirty, smudged floors. It’s key to use the correct steamer when executing this method, as high amounts of concentrated steam can damage some laminate floors. There are some really nice specialty laminate floor cleaners on the market. They keep floors looks shiny and new every time you use them. Some of these cleaners are pretty environmentally friendly, with natural ingredients and minimal chemicals. Make your own cleaner. Aside from water or steam, concocting your own cleaning solution can allow you to customize your ingredients with each use. There are plenty of homemade laminate floor recipes out there. Most are cost-effective and you do not need to use chemicals with them. There is a wide selection of both disposable and washable mop pads available for purchase through online retailers and local home improvement stores. You can find generic and brand-specific pads for the majority of mops. Check measurements and how the mop pads are affixed to the mop to confirm that the mop pad will fit. It can be difficult to find some of the specialty cleaning solutions. Therefore, it’s recommended to buy in bulk when the opportunity presents itself. This is yet another reason why having the flexibility to refill a cleaner dispenser is a huge value. After hours of research, the ranking process has been a whirlwind of microfiber, mop bots and plenty of water and steam. We’ve finally arrived at our rankings for the six best mops for laminate floors. While price, features and functions are always important variables when determining a product’s rank, consumer feedback and reviews also carry a considerable amount of weight in decision process. The O-Cedar ProMist Max Microfiber Spray Mop has worked its way to the top of the ranks. With a rock-bottom price point and all the features that make up a quality, yet simple laminate floor mop, it was an easy choice. While the handle doesn’t adjust for height, it does provide a solid grip space with the cleaner dispensing trigger housed within it. The mop head flips to allow you to use both sides of the washable microfiber pad. An easy-release cleaner tank makes it simple to pop the tank out and fill it with any laminate floor cleaner, or just water. Some users report adding a couple tablespoons of vinegar to a full tank of water for some added germ-killing benefits. The lightweight, slim mop can fit in tight closets and corners with no effort and the mop’s flexible handle allows for low-profile swipes under furniture and other tight spaces. 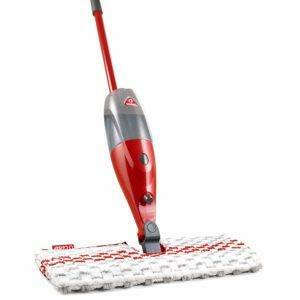 Dry sweeps can be made with the microfiber pad, so this little mop can run double duty as a broom. A quick rinse in the sink after a sweep, and the mop pad is ready for some floor cleaning action. Most users seem to love the O-Cedar ProMist Max Microfiber Spray Mop. Some reports claim that the mop head seems larger than most on the market, and is able to cover more ground in less time. Some mop owners reported issues involving the handle detaching from the mop head. This occurrence results in lots of struggles to fight through a mopping session with a semi-attaching handle. O-Cedar ProMist Max owners enjoy having the ability to control the span and spread of cleaner spray by tipping the mop up and down accordingly. This simple yet functional feature allows users to create narrow to wide spray paths, with varied cleaner amounts in each spray. Lightweight and easy to use, the O-Cedar ProMist Max is a substantial value. From the super-absorbent, double-flip mop head to the large on-board cleaning dispenser, this mop makes laminate floor maintenance a breeze. The flipping mop pad function can be a little tedious in tight spaces, like behind toilets and in corners. Re-adjusting the mop pad may be required when flipping in these applications, so prepare to come in contact with the dirty mop pad if needed. The Hapinexx Microfiber Dust Floor Mop seems to be a pretty premium product for the price. Though it doesn’t come with an on-board cleaner dispenser, the mop does come with various mop pads. The double-sided pads that are included with the mop have different functions, with one side handling the scrubbing and cleaning, and the other side designed to provide more of a floor buffing effect. Another set of pads is included that is useful for general cleaning or dry sweeping. 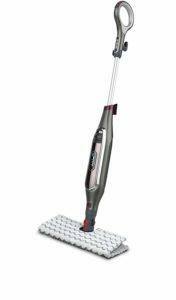 A detachable scrubber comes along with the Hapinexx Microfiber Dust Floor Mop. This small, handy plastic tool rides along on the mop head and is ready for action should the need arise to scrape debris from the mop pad. Basically, it’s a cleaner for the cleaner, and when its job is done, the tool pops right back onto the mop head. Mop pads are locked in place by a pretty substantial clamping system, helping even the sneakiest, slipperiest mop pads to stay put. The adjustable, lightweight handle makes moving the mop easy. With a 360° swivel head, this mop is super flexible and capable of reaching under the lowest-lying regions and up to ceilings and can easily be used to clean stair treads. According to a few user reports, the on-board scrubbing tool is pretty useful and a lot of owners use it more often than they expected. The mop’s durability is called into question occasionally. Though the mop handle is made of stainless steel, the rest of the components can feel a bit low quality. Users love the mop pads and enjoy switching between the styles in order to tackle specific floor maintenance tasks. The lack of an on-board cleaner dispenser means that a mop operator needs to have an external source of cleaning solution along for the job. While easily overcome by a standard spray bottle, it still means some extra baggage is along for the laminate floor mopping excursion. The strong, spring-loaded clamps that hold the mop pads in place allows for a variety of mop pad materials to be utilized without much of an issue. The mop pads that are included with the Hapinexx Microfiber Dust Floor Mop seem to be of high quality, but in a pinch (literally), other mop pads or cloth materials can be locked in place and used. The Shark Genius Steam Pocket Mop has made it to our ranking lists in previous reviews and is a handy and extremely functional cleaning device in various applications. We just can’t get away from this little steamer. The adjustable, three-setting steam control makes this mop versatile, and is necessary when it comes to utilizing steam to sanitize and clean laminate floors. Too much steam can do damage by creating too much moisture at once, while not enough steam just won’t do the job. One of the biggest perks of destroying dirt with steamy vapors is that steam leaves no trace. Streaks are non-existent when a steam cleaner is involved, thanks to the nature of the method. You do not need any additional chemicals or cleaning solution when mopping with the Shark Genius Steam Pocket Mop. A targeted spray nozzle releases steam on demand, directly in front of the absorbent microfiber pad. In a laminate floor application, this is ideal, as you can use moisture quickly to clean and then capture gunk, along with the dirt and film that comes up along with it. Don’t even worry about touching the dreaded dirty mop head when the steam job is done. The Genius Steam Pocket Mop lives up to name with its lever-action mop pad release. Just drop that nasty mop pad right into the washing machine. Done. The jury’s out on whether or not the stationary water tank is good or bad. Some users report that they prefer the non-removable tank, as it minimizes opportunities for leaks to spring due to the tank not being re-attached properly. Other reviewers complain this permanently-affixed tank is a flaw, because the entire mop has to be lifted or tipped over to empty any remaining water left over after a cleaning task is complete. The mop is easy to assemble and maintain. Users appreciate the extra mop pad that comes along with the mop. That way you can clean for a longer time. Overall, it seems that most owners really enjoy using their Shark Genius and it’s become an important tool in their home maintenance arsenal. The mop requires electricity to operate. The power cord is reasonably long, at 22’. There isn’t an on/off button; once it’s heated the water to a steamy state, the mop’s ready to go. With function comes a little extra baggage. The Shark Genius is still pretty lightweight at just under 6 lbs., but this is still quite a bit heavier than other traditional mops. Bona has become a household name among laminate floor owners. They developed this handy, lightweight line of mops specifically with hard surface floors in mind. While the price is a bit on the high side, the mop doesn’t skimp on its quality or thoughtful floor cleaning features. The money-saving refillable cleaner dispenser allows users to buy Bona’s fast-drying cleaning solution in bulk, or enables owners to mix their own solutions as needed. This reusable feature saves dollars and minimizes the use of plastic, tossable cleaning solution containers. The mop head is large and covers a lot of cleaning ground in one swipe. The edges of the mop head are rubberized and soft, protecting furniture and baseboards that it may come in contact with along the way. A trigger in the mop’s handle dispenses cleaner. This lever action trigger is easy to operate and even the lightest of grippers will have no trouble applying solution with the sprayer. 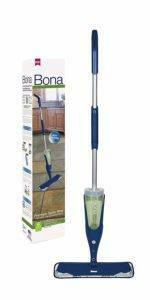 Bona has worked hard to develop Green-certified, low-chemical cleaning solutions for use with their mop systems. The mop manufacturer seems to recognize that the mop and cleaner work hand-in-hand to create satisfactory results; the best mop on the market can still leave streaks and dirty residue behind on a glossy laminate floor if the cleaner formula isn’t quite right. Users appreciate that the Bona Stone, Tile and Laminate Mop allows you to refill rather than replace the cleaner dispenser. Users also like the easy-to-use, manually-powered spray trigger in lieu of other designs that require batteries to power the spray action. A few reviewers complain of leakage due to the cleaning solution tank not being attached to the mop. This situation can be bad if you don’t notice it on a laminate floor. Most users love the Bona brand cleaners and rave about the cleaner’s ability to keep their laminate floors clean, streak-free, and smelling fresh. Extra cleaning pads are available for purchase, though the price for a pack is almost half the price of the mop itself. Bona brand cleaner can be a bit difficult to find sometimes, so if you fall in love with the specialized blend of solution, it’s best to buy it in bulk when the you have the chance. Anytime a floor maintenance product will do two jobs at once, we’re paying attention. The Bissell CrossWave Floor and Carpet Cleaner is a pretty nifty, work-load easing device. While the price tag is high, users are getting two cleaning appliances in one. The dual-action design is almost ideal for laminate floor applications, with minimal moisture staying on the surface of the floor after you swipe it with the mop. The ability to fire up the mop/vac and get going without having to sweep the floor first cuts cleaning time almost in half. The grime-grabbing microfiber brush system does an excellent job of grabbing dirt and dust while gently scrubbing and polishing floors at the same time. The mop has two tanks on board, one for cleaning solution and one for dirty water collection. 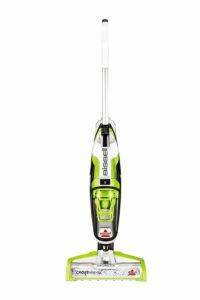 Rather than spreading a damp, grimy mop pad around the floor, the Bissell CrossWave captures floor gunk by suction and delivers it to the collection tank. You can release cleaning solution on demand. The mop allows the user to adjust for floor surface type. You can shampoo area rugs at the same time as you are mopping laminate floors with a simple push of a button. While the Bissell CrossWave Floor and Carpet Cleaner utilizes a vacuum function during its cleaning process, most users report that the CrossWave can’t necessarily replace a regular hardwood vacuum. Users report that maintenance is be pretty easy with the CrossWave. Owners enjoy the quick release brush system. It enables them to remove and rinse the microfiber brushes after each mop job. The power cord can be a little tedious to manage at times, though it does come in at a satisfactory length of 25’. The drawback of having a long cord is that management of said cord can get a little dicey when you extend it to its full length. Bissell cleaning solutions are the only ones the manufacturer approves for use in their systems. The good news is that they offer a variety of cleaning blends and most users seem to be happy with them. The mop is pretty heavy, weighing in at 11 lbs. The 2-in-1 functionality definitely justifies the added bulk, but it can also cause some headaches (and backaches) when you are moving it around the house. Ah, the robot mop. What a time to be alive when we can let a little scrubbing, spraying bot loose to keep our floors sparkling. 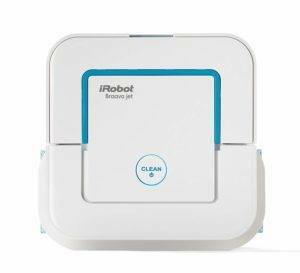 The iRobot Braava jet 240 Robot Mop is affordable and seems to be just bot for the task, with its compact design and three “moperating” modes. The Braava jet 240 attacks floor mopping jobs in a grid pattern, efficiently covering most the room in a mapped out manner. The mop will work in three different modes: wet, damp, and dry. Wet mopping involves a triple pass on each section of the floor, while the damp mop setting does a double. Water is the only solution with the Braava jet 240 Robot Mop. You don’t need to use any additional cleaners unless you want to spray a light mist of laminate floor cleaner in the bot’s path. This little bot is roughly 7” square and only about 3” tall, and has a flip-up handle. It’s easy to carry and can fit in lots of tight spaces. The water tank is easy to fill and offers a sizable holding capacity considering the mop’s micro size. You can set boundaries (virtual walls) for the iRobot Braava jet 240. As in any successful long-term relationship, this ability helps to eliminate a sometimes unsupervised little Braava from going where it shouldn’t. The mop comes with disposable mop pads, though washable microfiber pads are available as an add-on purchase. Reviewers report floors can get streaky if you don’t change mop pads frequently. Some users claim to notice that the amount of dirt and debris the reusable microfiber mop collects is dramatically higher than what disposable pads collects. Due to the tiny nature of this bot, big jobs aren’t quite its thing. A fully charged battery seems to allow for about 200-300 square feet worth of clean time. Users report needing to use the mop a couple times per week to keep up with normal dirt and grime build up. Quite a few Braava jet 240 owners report that the dry sweep mode is handy. You can do it in between mop sessions pretty easily. The disposable and microfiber pads seem to do equally well at this task. There are also reports of some users building some type of bot army to handle their dirty work for them. You can use the functions in tandem with a robot vacuum. The Braava jet 240 completes the automated cleaning trifecta. It’s only a matter of time before they start talking back. This mop just uses water, preferably distilled to protect its components. You can use vinegar in a lot of laminate floor mopping applications. However, you should not use vinegar with the iRobot Braava jet 240. The vinegar can corrode the little bot wheels. That renders the poor little motorized mop useless. The damp sweep mode tends to work best on laminate floors. That way, you introduce minimal moisture, but you pass over the floor twice over the course of the process. The detachable battery pack makes recharging it simple. The pack pops out of the mop and plugs right into a standard wall outlet. When the charge is complete, you can pop it right back in to the mop. This mop learns it territories and remembers obstructions that it encounters. The Braava jet 240 also keeps sprays away from furniture and baseboards. To set the Braava jet 240 up for success, make sure to place it in a way that will allow it to go with the seams of the laminate floor. There can be sub-par cleaning results in situations where the bot traverses opposite of the seams.